Why shouldn’t kitchenware resemble works of art? If you’re like us, they probably don’t get much use anyway, so they might as well look good. 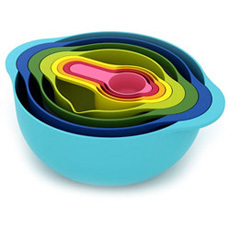 This colorful set includes a large mixing bowl, colander, sieve/strainer, small mixing bowl, and four measuring cups. All pieces are dishwasher safe and can be neatly nested for storage.